This product will be assembled, tested and personally delivered by one of our team on our own transport. We will then perform a full demonstration for you of the functionality of the machine and give any training that is required so you are confident using your new machine before we leave you. Arrangements can also be made to remove and dispose of any machine that your purchase is replacing. Welcome to the most convenient way to buy large Garden Machinery online! Just Lawnmowers v Garden Machinery - It Just Got Very Personal! You Deserve it! 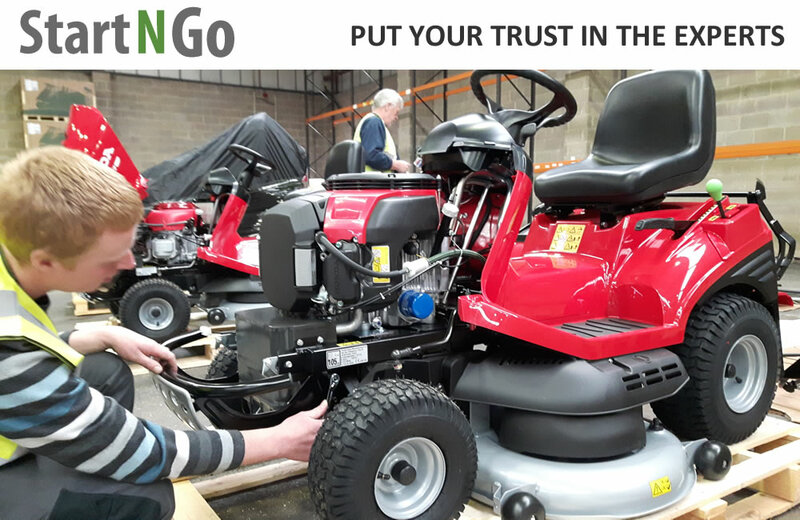 Here at Just Lawnmowers we have been working very hard to solve the problems associated with delivering large, complex machinery around the country - we believe that our premium Start N Go + service ticks all the boxes and means you will receive your new machine assembled, tested and then demonstrated on your own lawn at a time that suits you. At present we are only able to offer this service as standard in the areas detailed below but if you would like this service and are outside the currently covered area please feel free to call one of our Sales Team on 0345 222 0231 who will be happy to discuss your needs and provide a quote for a bespoke delivery. The reason we are pioneering this new service is that we have listened to the feedback from our customers, the concerns of manufacturers and quike frankly we want to offer a first class service and think our customers deserve it! Whilst we have been delivering machines successfully all over the UK for many years problems do occur when we are relying on a third party to complete the final and most important stage of the buying process - delivery. We don't want our customers having to wait in all day for a delivery. We don't want our customers removing a heavy machine from a wooden pallet. We don't want our customers having to deal with disposing of the packaging. We don't want our customers to be unfamilier with the functions of the machine. We don't want our customers struggling to dispose of an old broken down machine. We do want our customers to speak to us, tell us when they want the delivery, ask as many questions as possible regarding the functionality of the new machine and most of all be completely satisfied with the purchase - our dedicated team will do all the hard work in the background to make this happen. This is we believe the most comprehensive and complete White Glove Delivery Service being offered in the UK. We are Human, Helpful & Here! Start 'N' Go+ is exclusive to Just Lawnmowers. I recently bought my first ride-on tractor/ mower. I am new to this type of equipment and would consider myself a novice. Throughout, Just Lawnmowers were only too happy to share their expertise with me and advise on the most appropriate (not most expensive!) model for my needs. In my mind, this would have easily been enough to win them 5 starts. I was lucky enough to be part of a trial delivery service which I could not recommend highly enough. It was extraordinary. My new machine was hand delivered by Just Lawnmower experts who took the time to assemble and adjust the mower and the trailer (which they built for me from flat-pack). Everything worked perfectly. And there was not even the chance of a post-delivery headache. The JL delivery team spent time showing me how everything worked and what I should do in order to avoid potential usage/ maintenance issues in the future. Their commitment to ensuring I was comfortable working my mower even extended to them walking around my garden with me in order to point out specific usage tips for different working scenarios. Whether you are new to gardening or you're a seasoned professional I would highly recommend JL. You will not find better customer service (not even from the other, better-known, JL! ).